Our subscription structure is unique. It lets thousands of priests, pastors, and educators across the country reach everyone in their parish families throughout the year, in Spanish or English, with a cheerful, friendly, faith-based message. A single subscription means you can make as many copies of each issue as you need. And when you choose free electronic delivery, you can also easily reuse any content you like in other parish publications - with our blessing! All the content we present is reliable, orthodox and follows the guidance of the Vatican and the U.S. Conference of Catholic Bishops. You'll never see controversial topics or opinions in any InFaith publication - just practical, real-world ideas Catholics can use to live their faith more fully every day. 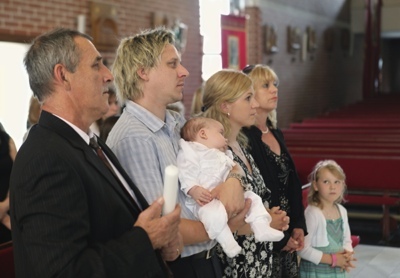 Every issue of Growing in Faith or Partners in Faith offers Catholics practical ideas to increase their love for weekly Mass, increase their time in prayer, lead Scripture-based lives, and learn more about their Catholic faith. Give each parishioner the practical help they need. 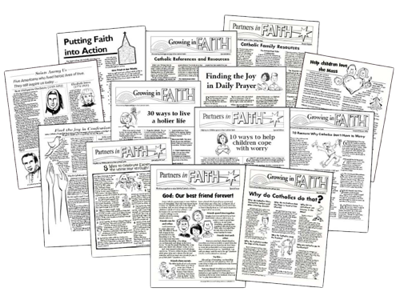 Plus, our subscribers can purchase additional, one-topic publications to offer even more help to parishioners and parents. For example: "Why do Catholics do that?" - a two-sided, reproducible issue with a dozen basic questions and answers about our faith. "Find the Joy in Confession" and "Finding the Joy in Daily Prayer" are one-topic publications subscribers can buy to give targeted, practical help in getting more out of the Sacrament of Reconciliation and in enriching any Catholic's prayer life.